A dominant high-pressure system is developing over northwestern Europe and is set to plunge the area into Arctic type conditions for the next ten days at least. 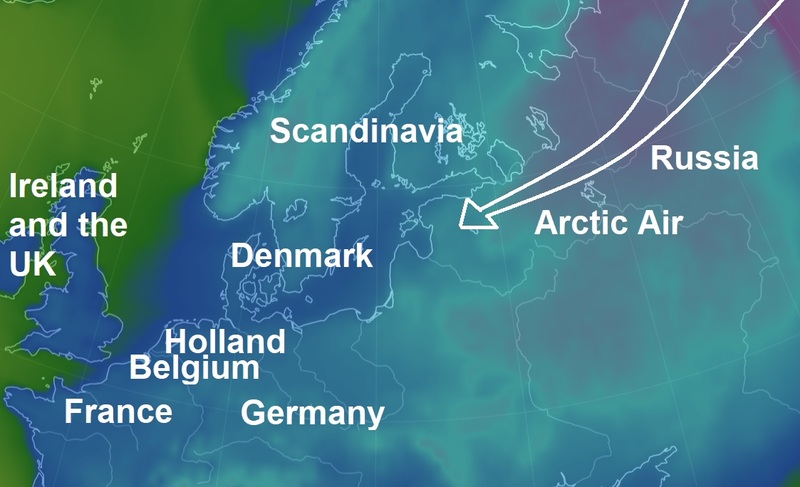 Western Europe and the UK will suffer their coldest period of the winter with many countries having to endure their coldest spell in years. According to the Met Office, cold air will spread from Syberia carried from the jet stream towards the UK and western Europe. By Monday it will turn very cold more widely and this will probably be the start of the coldest spell of the winter. Many places will remain dry into the start of next week, but snow showers are expected to develop in some places, particularly across eastern and southern England. The cold easterly wind will persist bringing a significant wind chill which will make it feel several degrees colder than thermometers indicate. The high pressure over Scandinavia bringing the cold easterly flow is expected to remain in place for several days and there are signs that the cold spell in the UK and parts of Europe is likely to last well into next week and perhaps into the following week. Indeed, there is potential for this cold spell to be the coldest for several years in parts of the UK and Europe”. March 1st is the start of meteorological Spring, but this year the first week of March is likely to feel distinctly wintry.